You will be staying in one half of a semi-detached house with a separate entrance. 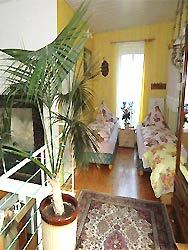 The stylishly furnished flat has an area of 70 m². 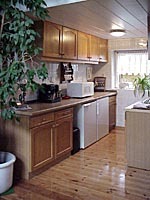 Up to 6 guests can be accommodated. 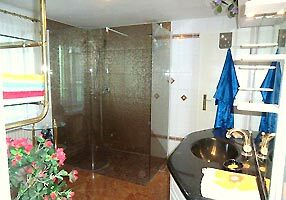 It contains one bedroom (upstairs) with two single beds. 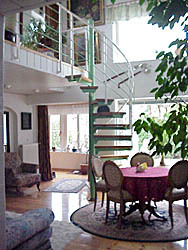 A double bed is also provided on the landing at the top of the staircase (see picture 2nd left). 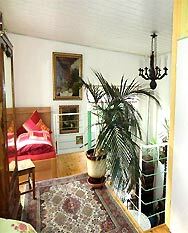 A further two guests can sleep on the couch (pictured here, top left). You can park your car by the house. Thanks to good transport links you can also arrive by bus or train. You can walk to the station in 10-15 minutes or go by bus in 3 minutes. In just 18 minutes, you can get to the Bahnhof Zoologischer Garten station by train, or in 30 minutes to the Alexanderplatz. It couldn't be easier or quicker... even from the centre of Berlin! You can find us in Dallgow-Döberitz north from the Döberitzer Heide heathland and west from Berlin, close to Berlin Spandau. The Döberitzer Heide heathland is among the most diverse and most beautiful protected landscape areas in the Berlin surroundings and are therefore perfect for walking or horse riding. You can also visit the Olympic village (1936). The prices depend on number of guests. The basic price is 70 euros for 1-2 guests. 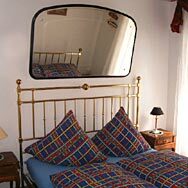 If you wish, we can offer you breakfast at a price of 6.50 euros per guest, with fresh eggs from our own farm, homemade jam, bread and rolls, smoked meats and cheese plate, coffee or tea. In the case of single night accommodation, we charge an extra fee of 4 euros per person. If you decide to stay longer, we can offer you an off-season discount (November - March). Every seventh night is free during this period. Your dog is welcome for an extra fee of 5 euros per night. The association of Döberitzer Heide conservationists offer you regular tours of Döberitzer Heide heathland with a guide. These walks are conducted by professionals in the fields of ecology and species protection. The Nature Protection Centre is open for public Tuesday to Thursday from 10 a.m. till 12 a.m.
Aside from the Döberitzer Heide heathland walks, there are many other ways to spend your leisure time. 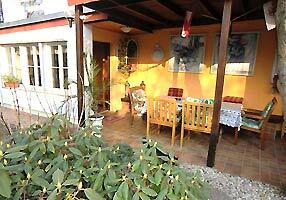 Dallgow-Döberitz and the area around Seeburg are well known in the surroundings as the "horse areas" and they offer the possibility of horse riding - for children as well as riding horse-drawn cabs and carriages. 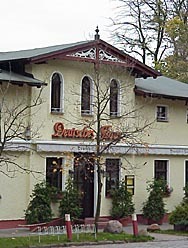 In Seeburg you can play golf, tennis, squash and badminton, or you can visit the fitness-centre or sauna. Rich in contrasts is the Havelland cycling path from the east to the west, from Berlin-Spandau across Nauen, Ribbeck and Rathenow until the regional border of Sachsen-Anhalt. The regional park Döberitzer Heide with its 33 km long hiking trail is right on the doorstep. Plus, the Sielmanns Nature reserve in Döberitzer Heide has 3442 hectares of biological variety including bison, red deer and Przewalski horses. The local Havelpark shopping centre offers very good shopping opportunities and is about a 15-minute walk from the house. The location is suitable for easy shopping – just a 6 minute drive away is the outlet centre on the B5. There are also yearly events worth a visit, including the country fetes, old-timer exhibitions and many more. Don’t forget how close the Waldbühne, Olympic Stadium and ICC Exhibition Centre are too! The capital of Brandenburg territory Potsdam is only 15 km away. You can find many very good restaurants in this location (close to the protected monument of the railway station). 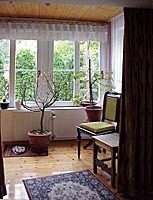 This holiday house is made available by Privatzimmer Sens, Agency for holiday apartments and guest rooms in Germany.